If a filmmaker has the ambition to make an epic period drama and gets the production bucks, plus a dream cast, there's nothing to stop him. 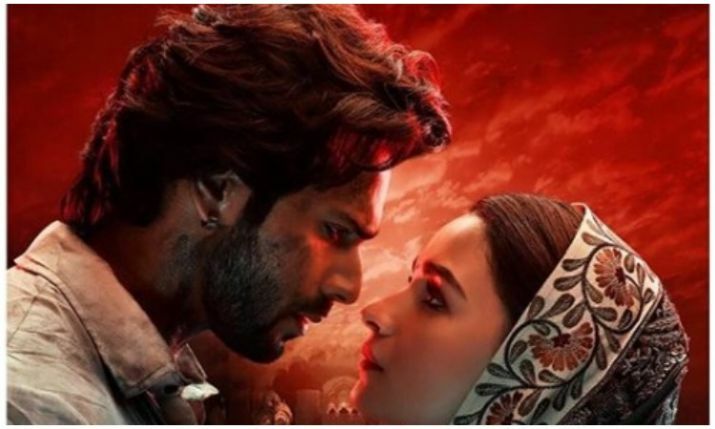 But this has to matched with vision and content, otherwise, after watching just the promos of Abhishek Verman's Kalank, it looked like he had aimed for the skies and landed in Sanjay Leela Bhansali territory. The love story set in Lahore, just before Partition, would have been considered old-fashioned in 1947! Satya (Sonakshi Sinha), dying of cancer, insists on Roop (Alia Bhatt) as her replacement (why her, it is not clear). Roop goes into the emotionally chilly Chaudhary household-- the father Balraj (Sanjay Dutt) and Dev (Aditya Roy Kapur) run a newspaper, that supports industrialisation and opposes the formation of Pakistan. Both these stances anger Abdul (Kunal Khemmu), who wants to protect the rights of blacksmiths as well as Muslims. In Lahore, Hindus are in the minority as characters point out, and Muslim mobs run riot in the streets. In these incendiary times, sword-maker Zafar (Varun Dhawan), illegitimate and discarded son of a tawaif, Bahaar Begum (Madhuri Dixit) and a rich man (anyone can guess who!) is busy bedding the women in Hira Mandi (Lahore's notorious red light area) and singing about being "first class." (Within the first few minutes of the film's beginning, there are three song-and-dance sequences). Verman's Hira Mandi is a grand and garish set, with massive havelis, a lotus pond and aerial dancers. Not to mention Bahaar and her girls twirling almost constantly, because those lehengas and dupattas look so lovely. There is no thought expended on the hypocrisy of a man sowing his wild oats, but a woman looking for passion outside of marriage is such a problem, that even the wronged courtesan, Bahaar, wants to nip this romance. Zafar, of course, has a hidden agenda in his seduction (strictly verbal!) of Roop, which is predictable enough to be funny. What is exhausting about Kalank is the excessive grandeur, the overwritten dialogue, the use of period setting just to have lavish sets, costumes, vintage cars, gondolas and chariots. Even when a woman is having a breakdown, she is prettily arranged on gold flooring. When Bahaar first hears Roop sing, she comments, that her voice is good, but lacks salt. That is exactly what the film misses too-- it is like a banquet without flavour. A filmmaker who dares a remake -- conceptual as he calls it-- of a film like Albert Pinto Ko Gussa Kyun Aata Hai, is already setting the bar too high. Saeed Akhtar Mirza, director of the 1980 film, knew what he was talking about and understood working class angst. Soumitra Ranade's Albert Pinto has plenty to be angry about, but issues like corruption and crime have been dealt with in many far better films, which prevents this one from having a distinct voice. Albert (Manav Kaul) is deeply affected by his father's suicide (caused by an unfair accusation of corruption) and decides on an impulsive and immature mode of revenge. He 'disappears' one day, as his family and girlfriend Stella (Nandita Das) tell a sceptical cop (Kishor Kadam), when in reality, he takes a road trip to Goa, in an open jeep driven by the worldly wise hitman Nayyar (Saurabh Shukla). Albert has been assigned a kill job, and he is eager to reach, even though Nayyar has wisely left the gun unloaded. Instead of the sharply-observed, bitter realism of the earlier film, Ranade's approach is to have his Albert suffer a slow mental breakdown and go through disturbing hallucinations. He throws away his career and a stable future with Stella, and starts raging against a system in which everyone can be bought. Ranade leaves the audience to construct a lifestyle and milieu that Albert represents from the testimonies of his loved ones, but he remains a puzzle. Kaul is a fine actor and captures the inner turmoil of the character, but pays no attention to little details like accent and body language to make his performance better realised. Nandita Das is miscast as Stella and other women Albert encounters, so Shukla ends up carrying the entire flimsy structure of the film. We are living in such a time of rage and political turbulence, this film had the potential of voicing our concerns through a protagonist not yet inured to a crumbling society-- it falls way, way short. Does India’s intelligence network have talent scouts in banks? That’s where an amateur actor Rehmat ‘Romeo’ Ali (John Abraham), a timid mamma’s boy with a nerdy hairdo, is recruited by the Reseach & Analysis Wing in Robbie Grewal’s convoluted and not too plausible, spy thriller,Romeo Akbar Walter. Coming as it does after the gut-twisting Raazi, set during the same period—the Bangladesh War of 1971-- also about an Indian Muslim going deep undercover in Pakistan, RAW seems like a boy’s night out in comparison. Still, the film is gripping in parts, even though it is sluggishly paced. Romeo is trained in subterfuge by the enigmatic RAW chief Shrikant Rai (Jackie Shroff—suits the part), renamed Akbar Malik and sent off to Pakistan-occupied Kashmir as a hotel employee. His primary task is to infiltrate the inner circle of arms dealer Isaq Afridi (Anil George), which he does with amazing ease—are criminals with connections in high places so gullible? Only the briskly efficient Pakistani Colonel Khudabaksh Khan (Sikandar Kher—surprisingly good) has the common sense to wonder how and why. This was the era before cell phones and computers, but telephone bugs, miniature cameras, notes concealed everyday objects and bulky transmission equipment are used to great effect, as Akbar sends crucial intel to help India prepare for Pakistan’s war moves. And, in the PM’s (“Madam” remains off screen) office, a man has the gumption to ask if it is wise to send a Muslim to Pakistan. Akbar has to remain constantly vigilant, and to help, he has a network of street spies run by a man called Joker, and a loyal helper (an excellent Raghuvir Yadav). More than using action, RAW tends to be a spy procedural, which can get dull, more so, since Grewal insists on songs, a stereotyped sweater-knitting mother (Alka Amin), a pointless romance (Mouni Roy) and that eye-watering, flag-saluting patriotism that is really not required. A man should be considered nationalistic enough if he is willing to risk his life for his country. John Abraham with his inscrutable look is perfectly cast as a spy. Top notch in the tech department, the film gives a nod to Govind Nihalani’s underrated Drohkaal, and uses several spy movie staples; in the end, it suffers from too much earnestness. Spy movies can also be fun! There are two important questions asked by characters in Ashvin Kumar’s No Fathers In Kashmir. An old man whose son has gone missing asks a freedom-seeking militant sympathizer who he wants freedom for, and what will he do when he gets it. An army man, faced with the cruel task of interrogating a kid caught illegally entering a sensitive border area, wonders who they are fighting and who they are protecting in the shadow war taking place in Kashmir, with an enemy they cannot even see. The film does not deign to seek answers, but takes a simplistic anti-Establishment route, painting the Indian army as the villain, and showing graffiti demanding “Stop Genocide,” without even a mention of what the Kashmiri Pandits went through, or the obvious lack of political will to deal with the vicious cycle of violence in which the innocents of the Valley have been trapped. That said, it is a poignant story of two families, suffering because a man in each was picked up by the army and never returned. 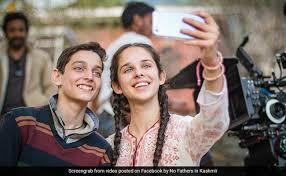 Noor (Zara Webb), raised in England is brought to Kashmir by her mother (Natasha Mago), because she has given up hope of her husband’s return and wants to remarry. Noor is a ditzy teen who wants a picture with a terrorist to post on Facebook, and goes about recording everything she sees on her phone. When disovers that her father had not abandoned them, as she was told, she wants to find out what happened to him. Majid (Shivam Raina), a sweet village kid, whose mother (Mara Sarao) is struggling to survive after her husband disappeared, befriends Noor. She, in her naively brash way ,drags Majid into serious trouble. Seeking the truth about their fathers, Noor runs into the slimy Arshid (Ashvin Kumar), who hides his deviousness under the local legend that he was brutally tortured by the army. The Valley’s half widows and half orphans live with the anguish of not knowing what happened to the men. The faces of Noor’s grandparents (Kulbhushan Kharbanda-Soni Razdan) are lined with sorrow. Ashvin Kumar’s portrayal of the old parents is the most sensitively handled—they do not want to stand in the way of their daughter-in-law’s future, but are also unable to give up the hope that keeps them alive. No Fathers In Kashmir adds to the list of feature films about Kashmir, like Hamid and Half Widow (unreleased), that go over the same ground, and make a plea for peace, at least for the sake of the children. In its quest to explore unseen-- in cinema— places in India, Qasim Khallow’s Gone Kesh goes to the small hill station of Siliguri, though the story of a young woman’s travails could have been set anywhere. It’s a charming but too realistic story, that is limited by the narrowness of its scope—losing hair could be traumatic for anyone, but once it is established that Enakshi Dasgupta (Shweta Tripathi) goes through most of her school days being mocked for her bald patches, there is not much more to add to that ordeal. Enakshi and her loving parents (Vipin Sharma- Deepika Amin) do all they can to find a cure, but their biggest concern revolves around the question: Who will marry a bald girl? And sure enough Enakshi keeps getting rejected by potential grooms. Khallow portrays the mundane existence of the middle class Sengupta family, with a marked lack of dramatic highs and lows; there is one mildly funny scene in which a man who has come to see her, requests her to dance to a Bollywood song, but the darkly comic potential of the story is never realized. Neither is the self-esteem crushing of a girl’s vanity portrayed with any depth. The parents take her to a succession of doctors, and one of them diagnoses her condition as alopecia--which is hardly a rare condition! The hormonal cure is worse than the ailment, and finally Enakshi realizes the drain her hair problem is on her father’s meagre resources, and accepts the inevitability of wearing a wig. She works as a salesgirl in a mall, has a silent admirer in Sujoy (Jitendra Kumar) and hopes to be a dancer, but her baldness holds her back. Strange that the viewer is told about her passion for dance—she quits her job to participate in a competition-- but she is never seen dancing. Her happily-ever-after is centred around the love of a man who is not put off her condition. Still, the film is appealing because everyone who understands how hung-up on looks today’s society is, would sympathise with Enakshi. The parents, with their modest ambition of travelling by plane once and seeing the Taj Mahal, are utterly endearing. Sharma and Amin are quietly impressive, without hitting a single false note. Tripathi and Kumar deliver confident performances too, well cast as the boy and girl next door, who are heroic in their own way.